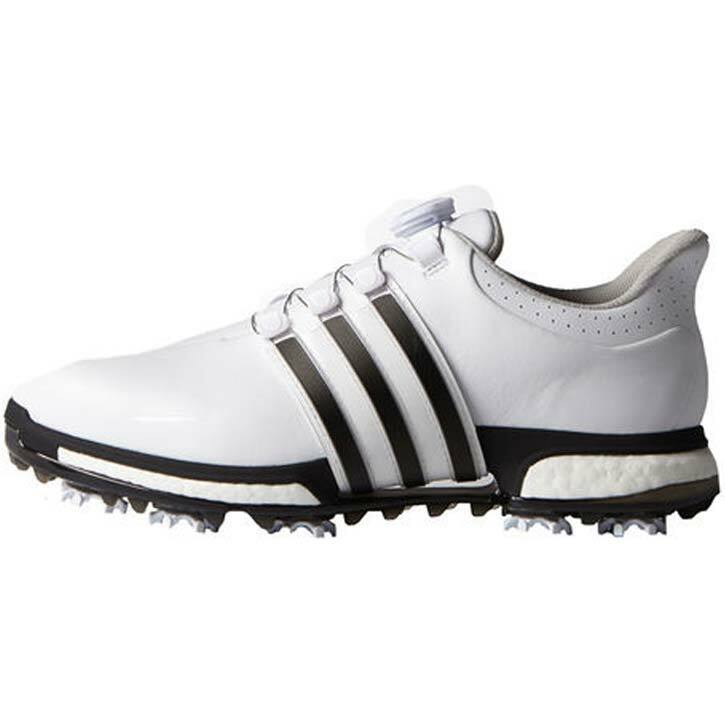 The Adidas TOUR360 Boost BOA Golf Shoes feature a premium leather upper with climaproof technology for a rich look, soft, comfortable feel and long-lasting protection and durability, the TOUR360 boost BOA helps you perform at your best while maintaining a sharp look on the course. It also boasts superior cushioning and comfort from its full-length boost midsole foam, a new heel shape that follows the natural contour of the foot, and re-engineered 360WRAP with lighter and more flexible saddle material. Plus, the advanced dual-density 10-cleat puremotion TPU outsole with CenTraXion and thintech cleats offer improved stability and grip where they’re needed most. Along with this, the new TORSION TUNNEL gives you independent flexibility and control between the heel and forefoot (with enhanced arch support and improved green friendliness), the fitfoam GEO collar and tongue foam deliver enhanced cushioning and comfort, and our etc. lining material reduces friction, moisture and heat for superior comfort and performance. Additionally, the most advanced use of a BOA® Closure System with incremental pull & push structure conveniently located on top center tongue offers more customizable micro adjustability. Click Here to learn more about the Adidas Tour 360 Boost BOA Golf Shoes.